Those 4-6′ tall weeds are an eyesore, that’s why. And worse, they infect the neighboring yards as well. 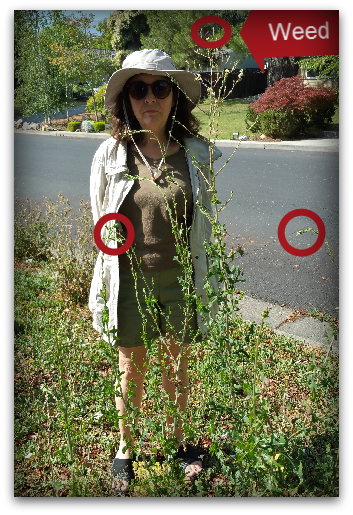 It’s not just one front yard sporting people-sized weeds – it’s a few. That’s very surprising since the Belwood area usually displays a lot of pride of ownership.Weeding is no one’s favorite pasttime. When the monsters get to be 4 and 5 feet tall, even chopping them down and leaving the roots would be an improvement both to reduce neighboring properties to infection but also for the neighborhood’s looks overall. 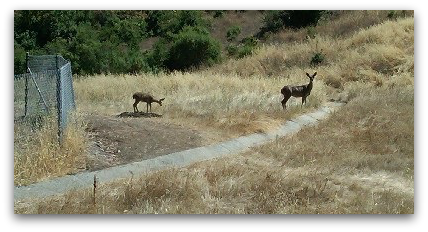 Tall weeds are not a result of the drought and they are not a neccessary part of water conservation efforts. Please be a good neighbor. Please do not let your front yard become a neighborhood blight. You don’t hear a lot of that around here these days, luckily. 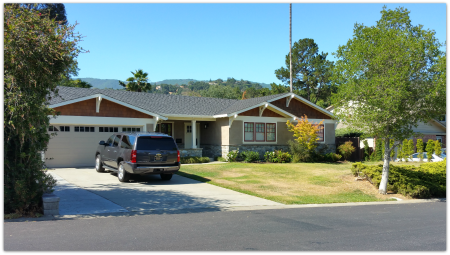 In fact, the opposite is true – most Silicon Valley neighbors, including folks in Los Gatos, understand that keeping a lawn perfectly green means that you are squandering a resource (unless you are painting your lawn green or have replaced it with artificial turf). In other words, due to our very severe and 4 years long drought, most home owners or tenants believe that it is unethical to water your lawn to the point where it is a healthy green. That new sense of ethics appears to be helping to get more people onboard. Having slogans like “brown is the new green” isn’t all that motivating. But noticing that yours is the only green lawn on the block might cause some (hopefully most) people to get with the program. There are oodles of rules about when and how much to water. 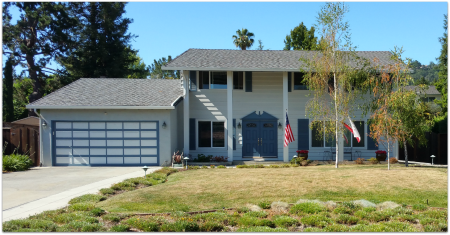 If you are a San Jose Water Company customer, you can water only twice a week, on set days (homes with even numbered houses, you water Tuesdays and Fridays, after 8pm and before 10am, for 15 minutes per zone max; for odd numbered days it’s Mondays and Thursdays). You are not allowed to hose down sidewalks, driveways, or cars. And water is never allowed to run off. Some of it’s intuitive, but much of it is not. You can report water waste in Belwood, Belgatos, or Surmont to the San Jose Water Company online – see link at the bottom of this article. There’s even an app, DroughtShame, for photographing and turning in offenders. Drought shaming is a way of trying to get neighbors to comply – not sure if it works or not, but it does appear that social change, meaning that most people embrace conservation and letting lawns go, does seem to work. Big thanks to the neighbors who are doing a good job of conserving. Some of you are ripping out lawn and putting in artificial grass or low water landscaping. Others are allowing once lush greenery to go “California blonde”, as my husband calls it. 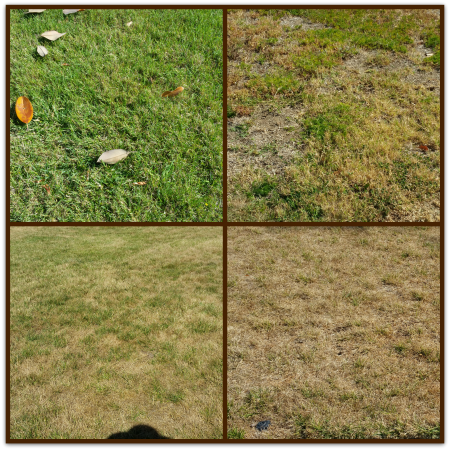 When we walk the neighborhood and see so many lawns which are barely hanging on, we know that a lot of people really do care about the drought and conservation. No one loves a dead or dying lawn – but it’s a very visible way of doing your part. Thank you. Has your yard been hit yet? For the last month or two, many Belwood and nearby residents have been awakening in the morning to damaged landscaping, particularly front lawns. One home owner phoned the Los Gatos Monte Sereno Police to complain about his vandalized front yard. But this time, it’s not human caused damage. 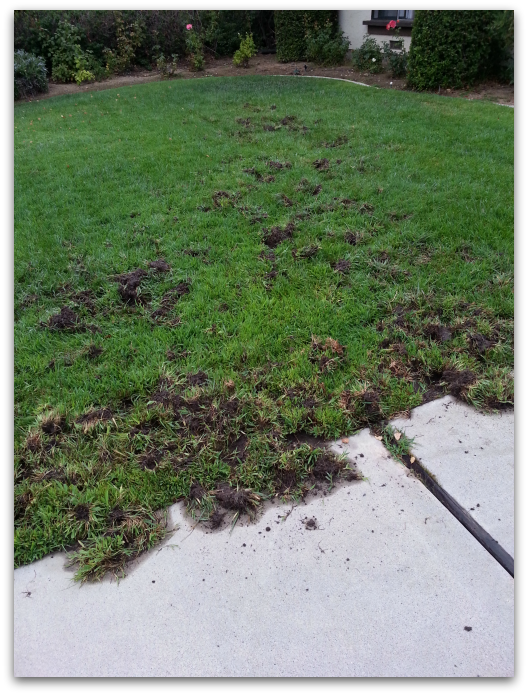 On several social media sites, neighbors vent that they have been victims of wild pigs or boars. But that’s not it – at least not for most of us. 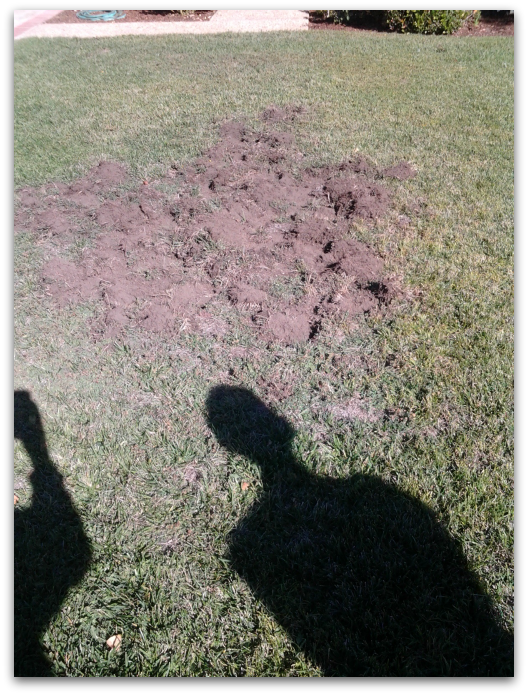 Boars do far more destruction and they are further in the hills, though perhaps if you are in the east Los Gatos foothills around Santa Rosa, or in parts of Almaden near open space that could be a risk. Although sometimes the damage is quite extensive, involving a large percentage of one’s front lawn, the guilty parties are usually hungry racoons. Crows may be assisting too, but they don’t create problems on as large of a scale. They are after a meal in the form of tasty lawn grubs. Grubs find their way into the soil to eat the roots of the grass, and those grubs seem to be the best eating in town for some of the local wildlife. If that’s not enough, squirrels like to bury food in lawns, too (someone is giving out peanuts in the shell – the squirrels keep burying them in our lawn – I’ve watched them!). The first photo is of our family’s front yard and it was taken in early September. The second one is of our next door neighbor’s place, and it was taken about a week ago. Most of the time, the racoons creep out in the middle of the night, but not always. A couple of days ago, our hungry hunters came back between about 6pm and9pm. It must have only barely been dark! 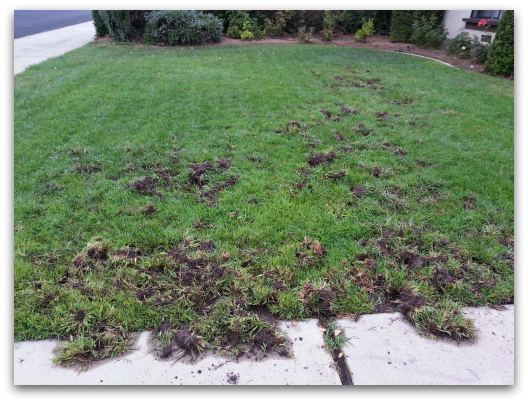 In my real estate practice, recently I showed a home with a lawn grub problem. The home owners there laid down something like a soft plastic chicken wire atop the lawn and similar landscaping. It did seem to work in terms of keeping the critters out, but it may not do anything at all for the grubs which are the Siren call to them. One grub solution is beneficial nematodes. These are a type of roundworm used to kill the grubs without using pesticides. This approach may work for some but I’m reading comments online that this has not been so successful for many who’s attempted to quash the grubs this way. There are anti grub pesticides available as well. Sunset Magazine advises that the best thing to do is to dig into your lawn and get some of the grub worms to take to your local nursery to identify the culprit, as different treatments will be more successful with one type of grub than another. No matter how you treat them, you do want to get rid of the grub worms, as a serious infestation will not only be unsightly, but eventually will kill the lawn. As plums fall from our neighbor’s trees, the deer come to assist in the cleanup. We walk our dog past this area daily and are noticing the distinct hoof marks left by the deer as they come to claim their dessert each night. On Alerche Drive, many homes have wrought iron fences and gates installed to keep the deer from devouring their expensive landscaping. For most of Belwood, Belgatos and Surmont, though, a 5′ tall fence of this sort is not feasible, nor would the local rules and regulations permit them anywhere close to the street. Aside from big barriers, what can be done to protect plants and trees from our voracious friends? The Deer Friendly website shares information on landscaping to avoid attracting deer as well as hints on barriers to them.